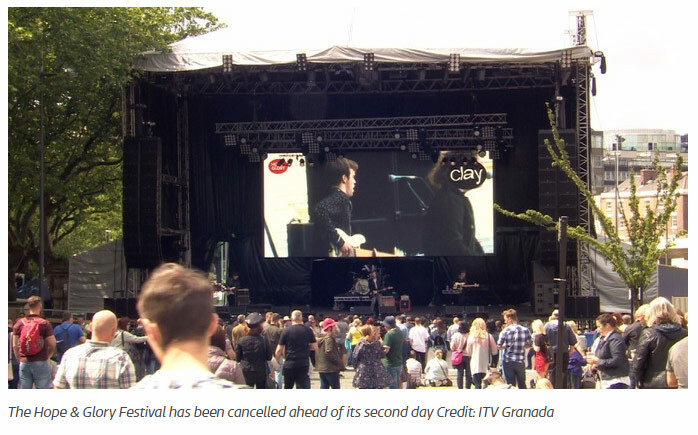 In August 2017 thousands of people were left angry and disappointed when the second day of the Hope and Glory Music Festival in Liverpool’s historic St George’s Quarter was cancelled, due to ‘safety concerns’ expressed by the organisers. On the first day more than 12,000 people came along to enjoy a gig headlined by a stream of household names – artists such as James, Razorlight, The Fratellis and Charlotte Church. According to the Liverpool Echo day one of this high profile event was “a catalogue of chaos”… the venue was overcrowded in places and there were long queues for toilets, drinks and food. It wasn’t just a local event – festival-goers had come from all over the UK with many opting for a 3 day stay in a city which has built a strong reputation for staging high-profile popular events. It was being billed as one of the highlights of the summer season in Liverpool, organised by a Staffordshire-based company Hope and Glory Festival Ltd. Despite the problems on the first day of the event a facebook post from the organisers st tried to quell the rumours that the next day’s event would be cancelled. Shortly afterwards this social media post was updated to say that the festival had now in fact been cancelled. This is how the story was covered on ITV news. Suffice to say that on Day 2 a tweet was issued by the organisers saying there’d be “no festival today” for “safety reasons”. Cue thousands of disgruntled music fans and performers on what should have been a wonderful occasion. Cue also a concerned city’s leaders keen to protect its reputation as a summer weekend tourist and leisure attraction. On occasions like this the local media comes into its own on behalf of the angry customers and this is exactly what happened in the absence of regular updated messages to the public from the organisers. The Liverpool Echo took up the cudgels on behalf of the festival goers and tried to contact the organiser, managing eventually to answer at least some of the questions posed by the thousands of disappointed festival-goers – especially for people whose weekend was ruined and who were left out of pocket. Information from the concert organisers seemed to come out in dribs and drabs via social media and then eventually a written statement handed out to the media and anyone else who was around on the site where the concert should have taken place. At no stage did on Day 1 or Day 2 did the organiser come in front of the press and issue a statement or answer questions. This lack of visibility contributed to the sense of chaos and incompetence. We all expect much more. People were told that if they wanted reimbursement for the tickets they had to contact the organisations who had supplied them in the first place which could have been any number of designated agencies. They were also told via social media that the organisers “were hurt by some of the negative and hurtful comments which have been levelled towards us on social media”. This was a key mistake. When more than 12,000 people have been turned away from a festival where tickets were priced at around £90 each, it’s not surprising that negative comments were made so don’t try to elicit feelings of sympathy from the victims! The company’s response was widely mocked and, it must be said, pathetic, from a PR point of view. The event organiser Lee O’Hanlon did eventually come onto Talk Radio the following day to speak to presenter Iain Lee about why the festival was pulled. Clearly a man who’d been under fairly continuous pressure for 72 hours he gave occasionally rambling and complicated answers to fairly straight questions. Indeed, Iain Lee’s frustration boiled over on a few occasions as caller after caller came on air to complain about various aspects of the event and Lee O’Hanlon just didn’t get to the point. In my view, Lee certainly didn’t cover himself in glory either and radiated more heat than light during much of the interview when he lost his cool and diverted attention away from the issue in hand. But despite the presenter’s shortcomings on that occasion, O’Hanlon did NOT come over as the man for the moment. He seemed to blame the production company (whom his firm hired) for most of the major problems encountered and although he openly said that he took ‘ultimate responsibility’ for the event and seemed remorseful in some of his comments, he does not ultimately come across as an effective communicator and became bogged down in detail and audibly upset with Iain Lee who interrupted him to try to get a clear and concise answer. He wants quick, easy answers when O’Hanlon seems either unwilling or unable to supply them. How many of those people who attended the Hope and Glory Festival will come to Liverpool again for a music event, whoever is ultimately at fault for what went wrong? Nobody wanted to be associated with the blame for the failure of the event so nobody put themselves forward to clarity a picture which increasingly seemed even more chaotic and shambolic as the days progressed. The messaging was confused and confusing and the organiser should have accepted responsibility for what went wrong in an audibly accountable manner much earlier and more effusively than he did. They agreed to fully reimburse the cost of all tickets wherever they were purchased even though it was not their legal responsibility. “As Skiddle’s mission is to put the customer first, we feel that this behaviour from the event organiser is completely unacceptable and have been using every resource possible to avoid this situation. “Skiddle did not have any involvement in the organisation of the event and all funds remain with the event organiser. Other organisations who came out of this extremely well were the ticketing company Eventbrite and the many clubs and pubs in Liverpool who agreed to stage gigs at the last minute with the booked artists who’d found themselves with nowhere to play. During Day 2 the organiser issued statements to the press and public via social media and a written statement but left it until the following day to appear on a national radio show. It may well have been that he was too busy on the front line trying to save the festival and liaising with police and council but that begs the question that if the owner was too busy on more important matters to speak to the press why did he not delegate? We as festival-goers and media consumers expect those in authority to stand up for us in such times. Yet on this occasion the lack of a highly visible spokesperson to explain what had happened and what was being done to rectify the situation was sadly lacking.